Poster award for our outcomes and unique methodology. 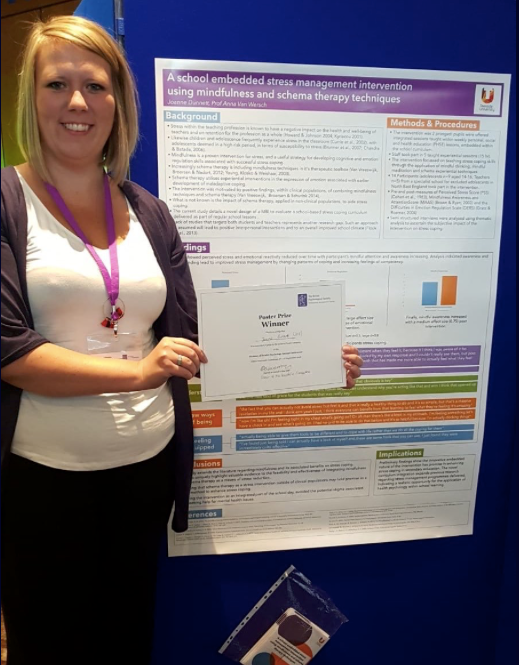 We are delighted to announce that the pilot for the research in our school won the Newcastle Poster Award at the recent National British Psychological Annual Conference. We run a successful therapeutic school in Newcastle with places for 12 of the most vulnerable and emotionally/behaviourally complex young people who are at risk of, or have already been, excluded from school or from alternative provisions. 100% of our pupils last year were Looked After children. The school has been running for 6 years and is independently registered with Ofsted, having an outstanding reputation working alongside schools, local authorities and other supporting agencies to help bring about transformation in the lives of young people who have experienced serious difficulties in mainstream education. As well as achieving academic success, therapy is embedded within the curriculum with qualified therapists working in dual roles as teachers/therapists within the ‘schematic model’ of the person, which focuses on cognitive behavioural therapy and attachment theory with emotional regulation so these young people can be helped to success post school and perhaps prevent a cycle of care or offending. Our success rate with these students is over 90% attendance and some return to full time education. We provide full family support overseen by a social worker who gives 80% of her time to working voluntarily for the charity and the other 20% she is employed on frontline services for Banardo’s. Pupils studying at our school in Longbenton benefit from fully modernised learning and recreation facilities. The classroom is a multifunctional teaching and learning base, specially designed to facilitate a relaxed, but structured, environment. They are encouraged to rewrite their story through specialised behaviour and motivation management, enabling them to face challenges in their lives, and to raise their academic expectations. The therapy is implemented and overseen by our trainee psychologist supervised by Teeside University, Middlesbrough, and Schema Insitite, Convent Garden, London.